Baghouse Performance Analysis & Control | Auburn Systems, LLC. For pulse-jet filters, B-PACs integrate cleaning control (control of solenoids and diaphragms) with measurement and analysis of differential pressure, particulate levels, header pressure, pulse counts, and running hours. Airflow, fan amps, temperature, level, and other inputs and control functions can be added for further enhancements. 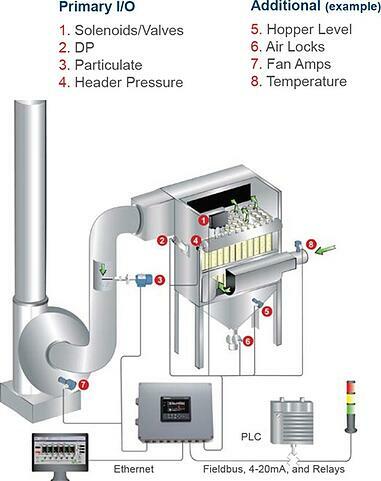 Th B-PAC provides a fast, 1-2 year, return on investment for any baghouse or dust collector - providing innovative technology for optimum control and EPA/OHSA compliance. The B-PAC provides IntelliPULSE pulse-jet DP/cleaning control, particulate monitoring, basic diagnostics, and a solid range of features, functions, and I/O via the MICS platform for general improved operation and maintenance planning. Think this will improve your operations - learn more today! MICS provides easy expansion, reduced spares, and simplified service.